I’ve always loved Caesar salad and every time I go to a vegan restaurant that offer it, I tend to order it, so why not try to make my own right? That’s exactly what I’ve done today. There are a few steps to this recipe but it doesn’t take long to prepare and the result is ridiculous!! Creamy and crunchy at the same time, it’s sheer haven!! Let me know what you think, I hope you like it as much as we did. Put the cashew and water on the bowl and leave it for one to two hours. The longer the better. Place all the ingredients on a blender and beat it until creamy. Heat a frying pan with a bit of sunflower oil or sunflower spray. Place the mushroom on the pan, making sure they are not one on top of the other. Fry for one minute each side and set aside. 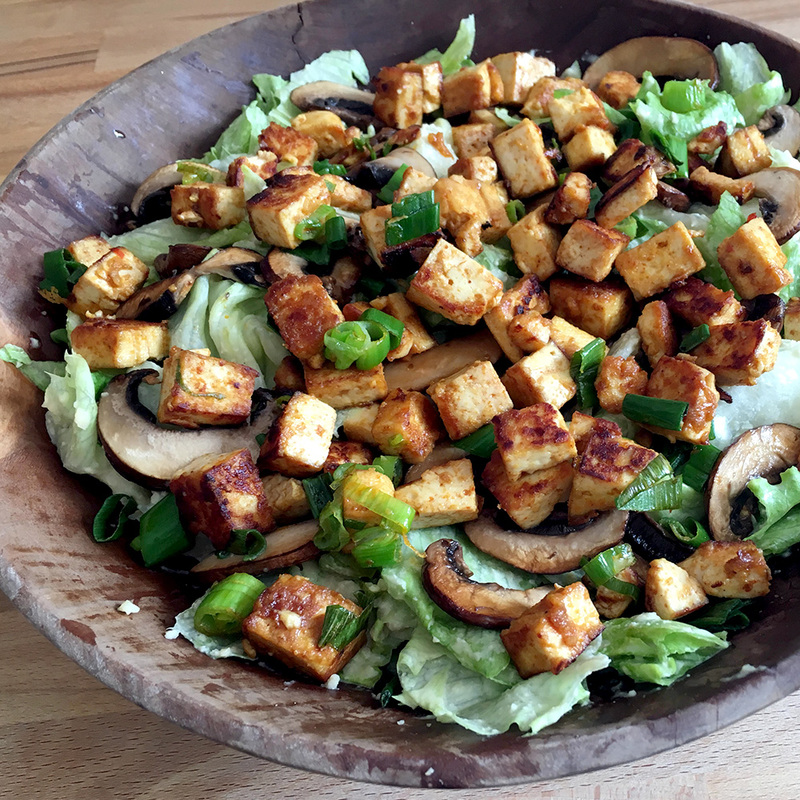 Using the same frying pan that you cooked the mushrooms add the oil, you can also use the sunflower spray if you want less calories on your salad. Place the tofu on the pan and add the rest of the ingredients. Cook it for about 5 minutes, stirring some times to make sure that all the cubes are coated with the seasoning. Place it on a salad bowl, pour the dressing and using two forks make sure that the dressing is well distributed. Assemble first the mushrooms and then the tofu on top and serve straight away.